After almost a year of personal anticipation, I'm excited to announce that PhilaPlace is finally here! I had the pleasure of meeting Joan Savarino at the 2009 NCPH conference in Providence and hearing about this project as it neared the final stages of its development. In May, I attended a session at AAM, where my curiosity about this project was further stoked thanks to an intriguing presentation from the project's technical partner, Night Kitchen Interactive. From conception to completion, the PhilaPlace team has made a concerted effort to keep abreast of the latest trends in social history and in web 2.0 technology; their efforts have clearly paid off. Enough introduction already-- what is PhilaPlace? 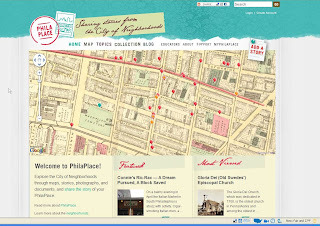 PhilaPlace is a map-based interactive website all about the history of Philadelphia's neighborhoods. Oral history, archival documents and photographs combine with user-generated stories and videos to highlight significant places on the changing map of greater Philadelphia. Maps provide the fabric on which the content of this website can be accessed. The visitor can choose to view a contemporary streetscape on a present-day map, a 1962 land-use map, or maps from 1934, 1895 or 1875. Stories and images that appear as sites on this interactive map can be filtered by historical topic, contributor or neighborhood. The website also provides a portal to a rich archive of content--- a feature that has become par for the course in well-designed digital humanities programs. This union of primary sources and snappy interactive features gives PhilaPlace the trappings of an excellent educational resource. PhilaPlace takes the content-based approach to providing educational resources preferred by many educators. (If you're curious about the opinions of some educators on digital primary sources, check out this survey I conducted last year on that very topic. Just let me know and I'll email you the password.) Instead of providing moment-by-moment lesson plans, PhilaPlace provides timelines, oral history resource lists and well-documented historical background, leaving the specifics to the educators. One thing that PhilaPlace has that other public history websites may not have is a real-world component. The Historical Society of Pennsylvania has developed a program of guided tours of the Northern Liberties and Soutwark neighborhoods of Philadelphia, appealing to a demographic desirous of an on-the-ground guided experience. As PhilaPlace grows both online and in the city itself, I will be interested to learn how these two modes of exploration complement one another. 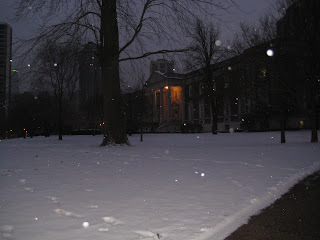 I had the privilege of spending this frozen New Years Eve in Chicago with friends, and being good museum-goers, we started our weekend with a visit to the Chicago History Museum. Since Catherine Lewis's The Changing Face of Public History has become a mainstay of graduate Public History programs, I felt that I already had an introduction to the museum's current iteration. I entered expecting a museum intensely conscious of its audiences and desirous of creating a broad-minded yet still mostly laudatory portrait of its namesake city. My expectations, along with all of their inherent pit-falls were duly met. The museum's showcase historical exhibition Chicago: Crossroads of America pairs civics-textbook-like section headings with details that are fraught with controversy. My husband, a thoroughly educated layman, found the exhibition lacking in narrative drive. Exciting episodes like the 1968 riots were glossed over in favor of including a few Native American artifacts at the beginning and smidgeons from every form of labor (including commodities traders!) imaginable. The highlight of the exhibit is its central feature, a trolley car first produced for the World's Columbian Exposition of 1893 accompanied by mannekins programmed to quote from contemporary letters representing a meeting of an out-of-town youth visitor, an African American woman activist and an immigrant laborer who helped to build the pavilions for the fair. I would have loved more like that! This museum is most certainly worth a second visit and I look forward to returning to spend more time in the temporary exhibitions, often allowed to more fully embrace a single curatorial vision. 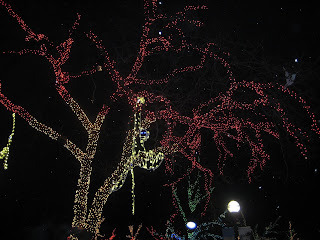 After visiting the museum, my intrepid party braved the cold and headed over to Lincoln Park Zoo to view the ZooLights illumination conspicuously sponsored by ComEd and Charter One. This family-friendly venture was fun and corny and pretty impressive, but I couldn't help feeling badly for the animals with all the unnatural illumination and blaring Christmas music. I might have to ruminate on this further at a later date.